The A-513 Closed End Pressure Manometer is an absolute pressure gauge with a range of 1-150 mm consisting of a glass U-tube sealed at one end, containing a measured amount of mercury and mounted in a glass dome. The scale is graduated 0 to 75 mm in 1 mm divisions, upward and downward from mid-scale zero. Tubulations on the base take 1/4-in. tubing. 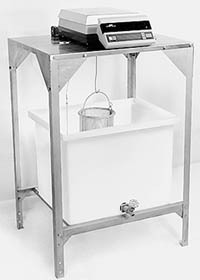 The device is constructed to retard mercury surge when the vacuum is released.